Some people do work hard and “deserve” the fruits of their labour. There’s nothing wrong with “treating yourself” when you do so within your economic means; experts actually recommend it. Some people do bad things and “deserve” punishment. And to be fair what you consider to be a sense of entitlement is just as prevalent among the old as it is the young…where do you think they learn it? You admit to the same sense of entitlement yet decide that this young man doesn’t “deserve” his purchase. Who are you to determine what everyone deserves and whether they appreciate it? Judge not lest ye be judged. I read your response this morning and was mortified. Thank you for writing and giving me a chance to explain more clearly. I wasn’t suggesting that people should never reward themselves, nor that they haven’t earned those rewards. And yes, I completely agree that doing things for yourself is a healthy, normal thing to do. Working hard, without any personal reward, makes no sense at all. The word “deserve,” brings a lot of other connotations with it. It is the belief that by doing certain things right, you deserve all the right results, and that is what you will receive. I wanted to point out that sometimes, outside circumstances (which I put under the umbrella of “luck, good or bad), step in and change everything. “Deserve” falls out of the equation a lot of the time. 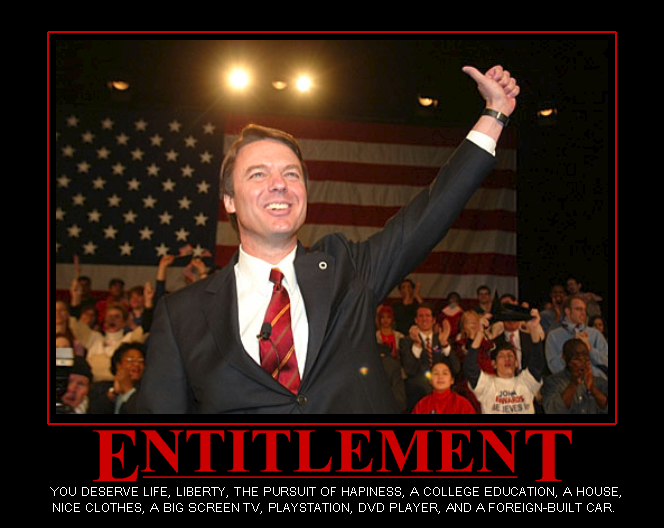 As I said in my first paragraph, entitlement is really the heart of what I’m talking about. It disturbs me in many ways. First, it goes beyond the idea of earning a just reward for your efforts. Entitlement says “I deserve these things because I am ME.” And my problem with that kind of thinking is that if it is to be true, it applies to all people worldwide. People in third world countries are entitled to as much as we are. Does someone working hard in North America deserve more than someone working hard in a third world country? Does someone who comes from a family that encouraged education deserve more than someone who was abanadoned and grew up on the streets? Second, by elevating material things to the level of basic human rights, entitlement can cause dissatisfaction if those goals aren’t met. Third, sociologists believe the the growing sense of entitlement, especially in our youth, causes a lessening of values and with that, an increase in crime. I do relate. Certainly, at the end of a hard week’s teaching, I always felt I’d earned my wages and deserved a reward. We are trained to think that way. You have presented your voice amongst a postmodern discourse. So too Bob Doe. No need for apologies as in a postmodern paradigm, all thoughtful voices are considered when arriving at what are, in the end, only approximations of TRUTH (whatever that is). The modern era had limitations and claims to one objective TRUTH. This staunch paradigm lingers. SEE THIS FROM WIKIPEDIA: Postmodernist theorists were interested in examining the variety of experience of individuals and groups and emphasized differences over similarities and common experiences. So in a postmodern word, write on, Linda. Your voice needs to be heard. If you feel the need, apologize to those who have taken offense but let no one silence you from airing your unique experiences that really do in the end have universal meaning for many. Thank you for your input Margie. You have explained exactly the perspective I was writing from. Unfortunately, by including some personal information, I muddied the waters a little and made a few people feel that they were under attack. It’s not at all what I intended. Journalists rarely apologize to those readers they may have offended, but my circle of readers is smaller – hence my regret. Others may not agree with you – but I do…. I find that people treat God / Universe / word of choice as if this creative force behind our lives is “Santa Claus”. It is true that you can do everything right – and not succeed. It is also true that you can do everything wrong – and get things dropped in your lap. I think this is a mystery about life. There is a fine line between praying with faith and leaving the rest up to “God” and blaming the victim. I think it is too easy to blame the victim of truly bad circumstances. We cannot lose our sense of compassion, no matter our own circumstances. I agree Monique. Thanks for stopping by and sharing your thoughts.